A report based on 30 months of observation (January 2014 to July 2016) shows that except for one month, the average monthly suspended particulate matter (SPM) count in Kolkata has always remained above the permissible limit. It is with special concern I point out that the PM 2.5 count during the entire period stood at 60 micro grams/cubic metre while the World Health Organization has put up the upper limit at 25 microgram/cubic metre. It looks like the city’s air quality remains toxic throughout the year. Even the US Consul General remarked during a recent meeting held in the city that “on several days the air in Kolkata is worse than Delhi” (Times of India report, September 16, 2016). The major factor contributing to Kolkata’s dangerous air quality can be attributed to the city’s transport system, besides the increasing carbon footprint of the Kolkata Municipal Corporation (KMC) and its efforts to beautify the city. It is interesting to note that Kolkata has recently received a British government grant amounting to 100 million pound to make it climate resilient. In reality, the transport authority of Kolkata seems to be driving in the opposite direction by banning more than 174 roads used for bicycle rides in 2013. Following a public interest litigation, the government reduced the figure to 62 roads banned for bicycle rides. Bicycle is a non-polluting mode of transport. It provides livelihood to thousands of poor people carrying out small business and engaged in essential services. The state government had no reason to ban bicycles on roads on the plea that it could lead to road accidents. There is no evidence to support this theory. To ensure safety, traffic authorities can enforce a rule that all bicycle riders must have a tail light (red glass reflector) and a lamp attached to the front handle. This was the rule during the British colonial period, but has now been abolished. The state government is also trying to phase out tram lines laid in the city in 1903. Like cycles, trams are non-polluting. This is being done to supposedly ease out vehicular traffic on the city’s roads. The reason given for phasing out the city’s heritage is that trams occupy too much road space, carry few people and slow down traffic (Hindustan Times, September 18, 2016). The real reason is, however, the greed on the part of the state government and its plan to sell off large chunks of land owned by the Calcutta Tramways Company and used as tram depots. Land sharks are eying these lands with the ultimate motive to build high-rise buildings. 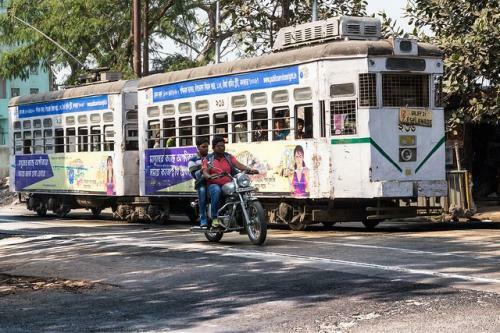 The land of Tollygunge tram depot covering 16321.21 square metres of open area has already been sold to a real estate agency at Rs 181 crore. What is needed is investment in modernisation of tramways by changing the old coaches, making them fast moving and restoring the original network of tram lines. Most of them have shut down on the pretext of roadwork. Kolkata is the perhaps the only city in India besides Mumbai which has been marked globally as a city most likely to face climate-related disaster. Two studies have been made on the city of Kolkata and climate change. One has been published by WWF India, policy paper number 4 (2010), and the other has been done by the World Bank (2011). It is strange that even after concrete evidence of the increasing vulnerability of Kolkata to climate change, the state government is moving in the opposite direction. It is either abolishing environment-friendly transport systems or increasing carbon emissions in the name of beautification.